The inclusion of WCAG 2.0 accessibility requirements to their new website was fundamental to the project. atWork Australia has been helping people with disability, mental health conditions, illness or injury find and keep jobs for over 15 years. As part of the federal governments Disability Employment Services, from 1 July 2018, atWork Australia provides this support in more than 170 locations across Australia, enabling more than 5,000 Australians with disability to find meaningful, sustainable work. 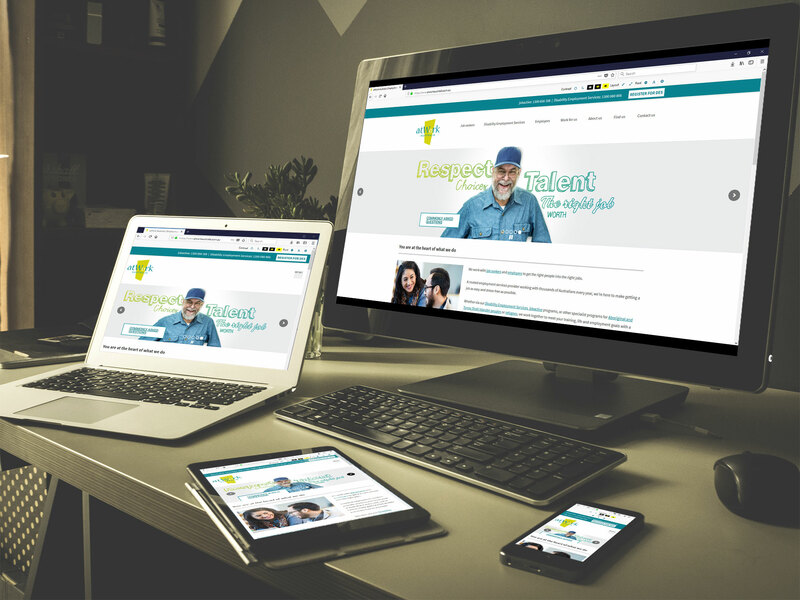 As a direct result their new WCAG 2.0 website development has been designed and built to ensure the people they assist can readily and easily navigate the site to access the information they need. The pages have contrast features throughout and have been carefully constructed to be screen reader friendly. The new website project required a highly detailed approach to account for WCAG 2.0. As with the bulk of MOO Marketing Agency’s websites, the content management system used is WordPress. This gives flexibility in design and ease of use for the ongoing addition and management of content. atWork Australia staff have been trained in the use of WordPress providing a cost effective solution to the ongoing site management and updating.